The #50WomentoKona Movement & gender equality in sports. The #50WomentoKona Movement and gender equality in sports. It is amazing that even now there continues to be gender inequality in sport. This weekend history was made in England when Oxford women’s crew raced for the first time against the Cambridge Women’s crew over the same exact 4.2 mile race course as the men’s teams and it was televised too. The famed Oxford-Cambridge Boat Race had been since its inception a celebration of men’s rowing. This annual event is celebrated once a year on the banks of the Thames in Kentucky Derby style fashion to see which crew will prevail after months of grueling training. The Women while allowed to race were had never been allowed on the same course (the women’s course was always much shorter), had never been given the same financial help, and were never celebrated in the same fashion as the men’s race. For the first time ever this weekend “The Boat Race” was different as the Cambridge Women went head to head on the Thames signaling a shift in the views on women in sport. We have come along way in creating equality in sports since Title IX was enacted on June 23, 1972. However there continue to be discrepancies in giving women equal opportunities to compete. Currently in the sport of triathlon there is a movement happening for change to allow 50 Professional Triathletes compete at The Ironman World Championships in Kona Hawaii. An important discussion today Join the discussion about the #50WomentoKona Movement and gender equality in sports. The #50WomentoKona Movement was started to address the inequality in number of professional entry slots given to men and women at at the Ironman World Champsionships and Ironman 70.3 Championships. Women are currently given only 35 slots as compared to the number 50 given to men. Ironman USA explains that the difference in number of slots given is due to the difference in the overall percentage of women who compete in triathlon (33%) to men (67%). The other explanation given is that because of this difference in the numbers that the women’s field is less competitive. While, I understand the difference in percentages as an argument I do not agree with the sentiment that the women’s field is less competitive. By refusing to make the number of slots equal USA triathlon is missing the point. One of the best was to encourage women to join in the sport of triathlon and to make the sport more competitive is to showcase the professional athletes on a national stage. I remember watching the Ironman World Championships at Kona on TV when I was younger and being inspired by the incredible strong female athletes pushing their bodies to achieve their biggest dreams. I remember wanting to be like those women. Having strong athletic role models is so important for encouraging young girls to get into sports and to showing them that those big dreams can be a reality. Let’s remember how much USA women’s soccer has inspired a boom in the participation of girls everywhere wanting to be just like Mia Hamm and Julie Foudy. It’s just a guess but I bet the Oxford Cambridge Boat Race now being supported in the same way as men’s rowing in England will inspire a new generation of female rowers. When I was growing up I attended an all girls school where we were always challenged and shown opportunities that we were told were never to big to go after. This should be the reality in sport. The sport of women’s triathlon will grow as girls everywhere are shown that they too could earn one of the 50 spots at KONA and the 70.3 championships that should be offered. If the Women for Tri Board (part of USA Triathlon) wants to see the sport of Triathlon growing then they should encourage women to go for 50 spots by challenging them to go for it. 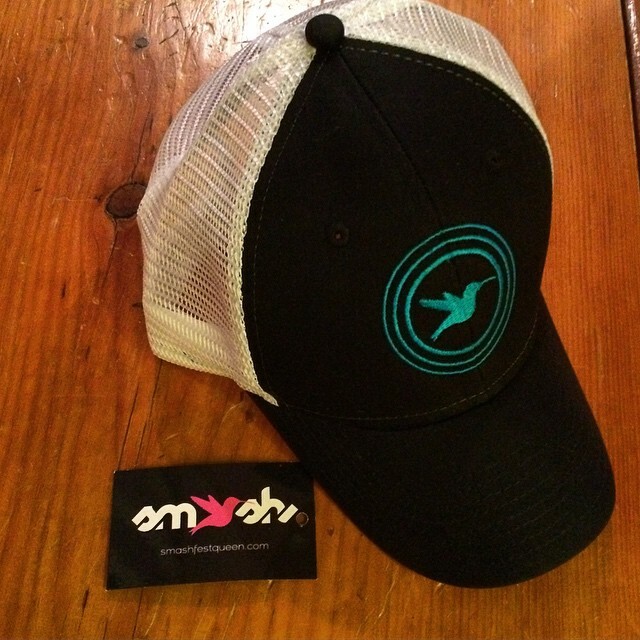 Many companies have joined the #50WomentoKona movement including SMASH a women’s triathlon and cycling apparel company started by my friend Michele and Pro Triathlete Hillary Biscay. SMASH supports #50WomentoKona. What about you? 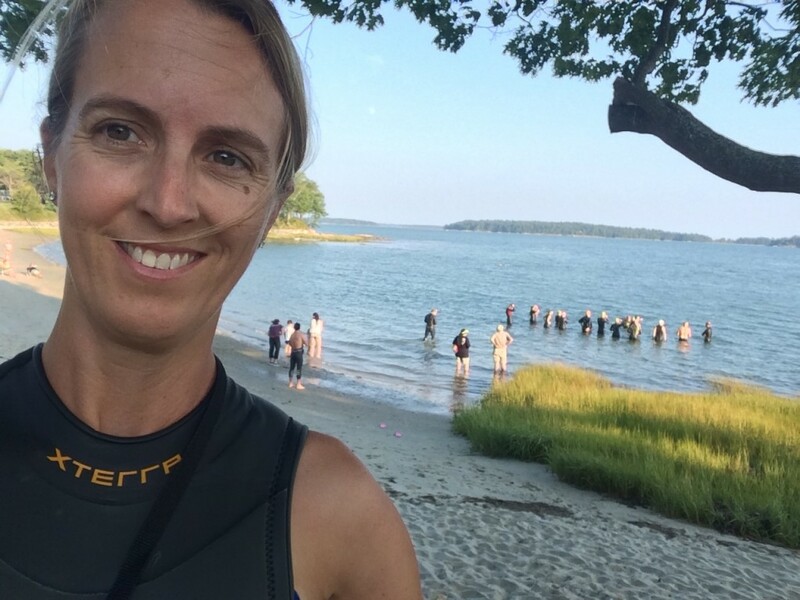 Hillary Biscay had started as one of the original members of Women for Tri Board when it was clear that change was not on the horizon for women in triathlon. Biscay has joined others in creating TriEqual in hopes of making greater change in the sport of triathlon for women. If you are interest in making a difference in this movement, TriEqual has opportunities to volunteer to help spreading the word. 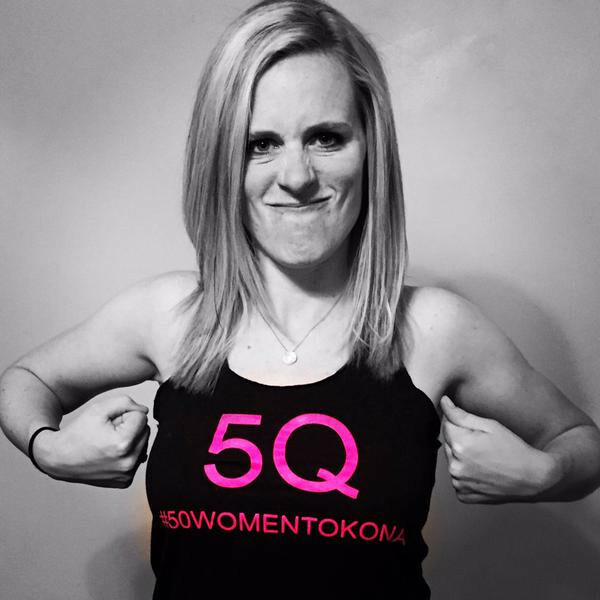 SMASH is currently offering a tank on their site where “SMASH will contribute all profits from the sale of these tees to a Kona-travel fund for the woman in the final Kona-qualifying spot this year.” Their hope is that this will be for spot number 50. I may never be an Ironman racing at the World Championships at Kona but as a new triathlete and woman preparing to race at my first Ironman 70.3 this summer this movement has taken on extra importance. I hope that you will take the time to learn more about the #50WomentoKona Movement and that you too will join in supporting gender equality in sports. 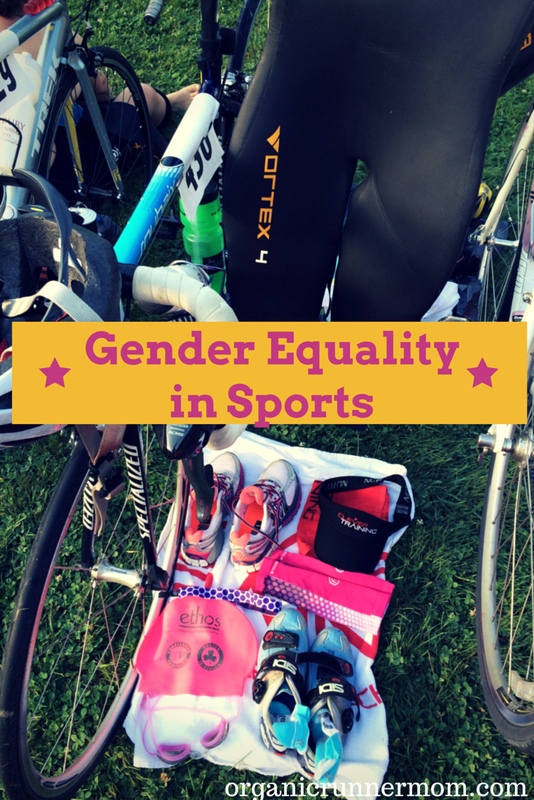 Please support gender equality in sports. What are your thoughts in the #50WomentoKona debate? Describe one of your moments in sports where you felt strong. I love this! Totally cool and fun to be a part of. Kind of cool along the lines of the skirt sports campaigns as well. You go girl! Can’t wait to watch you crush that 70.3. 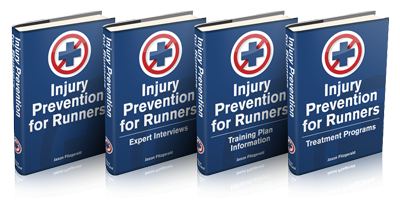 I will be doing 2 shorter tri races this year. Another friend of mine is a triathlete and I do not understand the resistence to not having the same number of elite women at Kona. It’s very disappointing they’ve already come out and said there won’t be any changes for this year. What a great movement! Everyone, women, men, young, old, disabled, every one should have an equal chance, support, and opportunity in fitness! What a fantastic movement! I suppose while I realized the inequality, it didn’t occur to me how deep-rooted it still was in tradition. A lot of this is disappointing, but the progress and efforts are encouraging! The casual sexism at these races is so frustrating. I love this movement!!! I love this! I was actually having a convo with someone the other day about gender inequality in sports, going to share this with them! Love this! Marathon races used to be predominately men, and now women are the majority. I say if a woman qualifies with elite times, she should be allowed to do the race as an elite – why put a cap on it, man or woman? I will be following this with interest too. I don’t think that women should be disallowed any sport. I did not realize this inequality existed but it makes me very happy it’s being addressed. All the best with your HIM this summer! This sounds like a great movement! Women are just as strong and as capable as men are! I always feel strong in any sport and feel like I can compete with any man. I do not have much experience with Kona since November 2014 but I do not necessarily feel there is inequality between the sexes. I guess acceptance is proportionate to the applicants. i think the whole argument supporting the 35 slots is crap. it is maybe one of the most ridiculous things i’ve ever heard and i can’t believe they are sticking by it. ugh. Great read! So inspired by your goal of a first ironman. This had soaked my interest for sure – I need to do some research. From my memory, slots were based on percentage of finishers in each age group, I didn’t engender a distinction between male/female (other than the proportions that entered the race). I am not a fan of discrimination, but also don’t want an unfair advantage, so now I want to learn more! Thanks for sharing on this topic!!! This is a great movement! It’s upsetting that there’s still this kind of inequality in this day and age! :[ I would’ve thought we’d have moved past this by now, but I’m glad this is raising awareness for it! Great movement! This is a debate more people need to be weighing in on and trying to change. Love it! This past year, I felt strong getting into the water and crushing my swim times. Just 35 slots. Really? That’s it? Whatever happen to acceptance and equality? Thank you so much for sharing this! It’s amazing that this kind of thing still happens – that we get put into a certain category or get judged just because of our gender. So crazy!